UNIVERSITY PARK – Penn State head football coach Bill O’Brien announced six members of his first coaching staff, bringing together a unit with extensive collegiate and National Football League experience. O’Brien’s staff includes two coaches who have helped LSU and Texas win the BCS National Championship during the past 10 years. The new Penn State staff also has significant coaching experience and recruiting ties in the Mid-Atlantic, Northeast, Midwest, Southeast and Southwest regions of the United States. During his introductory press conference last Saturday, O’Brien announced that long-time Penn State defensive line coach Larry Johnson would remain on the staff and he will continue to coach the defensive line. Ron Vanderlinden, the Nittany Lions’ linebackers coach since 2001, also has been retained by O’Brien and will continue to coach the linebackers. Stan Hixon has been named Penn State’s Assistant Head Coach and will coach the wide receivers. Charles London (running backs), Mac McWhorter (offensive line) and John Strollo (tight ends) also are joining the Nittany Lions’ staff. O’Brien is finalizing the quarterbacks coach. O’Brien is in the process of finalizing the defensive coordinator and secondary coach to join Johnson and Vanderlinden on the defensive staff. O’Brien, the New England Patriots’ offensive coordinator and quarterbacks coach, is bringing several coaches to Happy Valley that he worked with during his 14 years as a collegiate assistant coach. O’Brien has previously worked with Hixon (1995-99), McWhorter (2000-01), London (2005-06) and Strollo (2005-06) at Georgia Tech or Duke prior to joining the Patriots’ coaching staff in 2007. Hixon’s coaching career spans 32 years in the collegiate and professional ranks. The past two seasons, he has served as wide receivers coach with the Buffalo Bills and he coached wide receivers for the Washington Redskins from 2004-09. Stevie Johnson, Santana Moss and Antwaan Randle-El are among the NFL players Hixon has helped develop. From Lakeland, Fla., Hixon served as associate head coach/wide receivers coach at LSU from 2000-03. Hixon contributed to the Tigers winning the 2003 BCS National Championship and coached three first-team All-SEC receivers, including Josh Reed, the 2001 Biletnikoff Award winner, who made 94 catches for an SEC-record 1,740 yards that year. He also helped develop Michael Clayton, whose 21 career touchdown catches broke the LSU record. Hixon coached the wide receivers at Georgia Tech from 1995-99, where he worked with O’Brien, as they helped the Yellow Jackets capture the 1998 Atlantic Coast Conference championship. He also has coached at Wake Forest (1993-94), South Carolina (1989-92), Appalachian State (1983-88), and Morehead State (1980-82). Hixon is a graduate of Iowa State, where he played wide receiver, and earned his master’s degree from Morehead State. Johnson is entering his 17th season on the Penn State staff and 13th year coaching the defensive line. He has been instrumental in the development of seven first-team All-Americans in the past 12 years, including consensus first-team tackle Devon Still in 2011. Still also was the Big Ten Defensive Lineman and Defensive Player-of-the-Year. Jared Odrick (2009), Aaron Maybin (2008), All-Pro Tamba Hali (2005), Michael Haynes (2002) and Jimmy Kennedy (2002) were first-team All-Americans and NFL first-round draft choices under Johnson’s tutelage. His efforts with Courtney Brown helped him earn All-America honors in 1999 and become the No. 1 selection in the 2000 NFL Draft. Johnson also has coached 13 first-team All-Big Ten performers and has had a large role in the success of the defense, punting and recruiting efforts during his tenure. A highly successful high school head coach in the Washington, D.C. area for more than 20 years, Johnson is a graduate of Elizabeth City (N.C.) State University, earning NAIA All-America honors at linebacker. London comes to Penn State after serving one season as the offensive assistant/quality control coach with the Tennessee Titans under former Nittany Lion standout and Pro Football Hall of Fame inductee Mike Munchak. During the 2011 season, London helped the Titans to a 9-7 record and 245.2 passing yards per game, missing out on an AFC playoff berth via a tiebreaker. His NFL resume also includes one season as a pro scout for the Philadelphia Eagles (2010) and three years as an offensive assistant with the Chicago Bears (2007-09). He coached for three years at his alma mater, Duke, serving as a graduate assistant (2004-05) and running backs coach (2006). London was a running back and sprinter on the Blue Devils’ track and field team as an undergraduate. In 2005, he completed a coaching internship with the New England Patriots as part of the NFL’s Minority Internship program. He also earned a master’s degree from Duke. 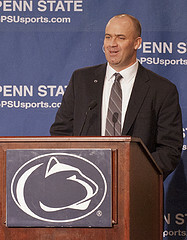 McWhorter joins the Penn State staff after serving as Texas associate head coach and offensive line coach from 2005-10. He joined the Longhorns’ staff as tackles and tight ends coach in 2002 and played a large role in helping Texas capture the 2005 BCS National Championship and play in the 2009 BCS title game. During the Longhorns’ title season, McWhorter’s offensive line was critical in Texas setting an NCAA record with 652 points and a school record with 6,657 yards, finishing No. 2 in the nation in rushing (274.9 ypg). A native of Atlanta and a Georgia graduate, McWhorter was selected the 2008 Assistant Coach of the Year by the American Football Coaches Association. He was the assistant head coach and offensive line coach at Georgia Tech, working with O’Brien, in 2000-01. McWhorter began his career as a high school coach in Georgia and moved into the collegiate ranks at Georgia Tech from 1980-86. He was head coach at West Georgia in 1989 and also has been an assistant coach at Georgia (1991-95), Alabama (1987-88), Duke (1990), Clemson (1996-98) and Memphis (1999). Entering his 32nd season as a college coach, McWhorter was an All-SEC lineman at Georgia under coach Vince Dooley. A 31-year coaching veteran, Strollo joins the Penn State staff after one year as the offensive line coach at Ball State. A native of Long Branch, N.J., Strollo went to Ball State with head coach Peter Lembo after serving in the same role under him at Elon (2008-10). He was the tight ends coach at Duke in 2005 and the offensive line coach during the 2006 and ’07 seasons. A Boston College graduate, Strollo began his coaching career at Middletown South (N.J.) High School and he was a graduate assistant at Springfield College, earning his master’s degree. His coaching resume also includes stints at Maine (2004), Cornell (2001-03), Lafayette (1996-2000), Massachusetts (1991-95), Northeastern (1984-90 and 1981-1982) and Washburn (1983). Strollo served as the offensive coordinator at Cornell and Northeastern. Vanderlinden is entering in his 12th year as linebackers coach and has been the primary force in helping restore the “Linebacker U.” tradition. Vanderlinden directed junior Gerald Hodges to first-team All-Big Ten honors in 2011 and was instrumental in the development of Cameron Wake, who earned 2010 All-Pro honors. All three 2009 starting linebackers earned All-Big Ten honors and are on NFL rosters, with San Francisco’s NaVorro Bowman being named to the 2011 AP All-Pro Team and Sean Lee a rising star with the Dallas Cowboys. In 2007, All-American Dan Connor became the school’s career tackle leader and won the Bednarik Award. Vanderlinden also worked with Paul Posluszny, the 2005 Butkus Award recipient and two-time first-team All-American and Bednarik Award winner. Vanderlinden was head coach at Maryland (1997-2000), defensive coordinator at Northwestern (1992-96) and a defensive assistant coach at Colorado (1983-91). His defensive pupils at Northwestern included two-time Bednarik Award winner Pat Fitzgerald. He also coached at Michigan and Ball State after graduating from Albion College, where he twice earned all-conference honors at center. The Nittany Lions shared the Big Ten Leaders Division title with Wisconsin and finished with a 9-4 mark during the 2011 season. Penn State played in its fourth consecutive New Year’s bowl game and 44th overall. The Nittany Lions’ 827 all-time victories rank No. 5 in the nation and their 27 bowl wins are third-highest. Penn State opens its 126th season on Sept. 1, hosting Ohio University. Ohio State, Wisconsin, Northwestern, Indiana, Navy and Temple also will visit Beaver Stadium this fall. For season ticket information, fans should call 1-800-NITTANY weekdays from 8 a.m.-5 p.m.